For my the online task, I decided to base my alter ego on an existing character from one of my personal favourite anime shows, “Durarara!”. The photo isn’t particularly realistic, as the character, Celty Sturluson is a mythical being from Ireland, similar to that of the Grim Reaper, has had her head stolen. I know people won’t believe I really am a headless being, but people who know the show will likely assume I am an obsessive fan who has enough free time to create a fake Facebook account. The character is female, I did try to remove my Adam’s apple from my neck, but I think my shoulders are broad enough to be a giveaway that I am male. For a cover photo I choose a motorcycle, which is synonymous with the character, parked outside a ramen shop in Ikebukuro, the district in Tokyo that Celty lives. On the profile, I tried to fill in as much information as I could find about Celty, trying to give her an accurate representation. I had to create a workplace named “underground transporter” with a job title of motorcycle courier because in the show the name of the company she originally worked for is not revealed, likely because she transports illegal goods. For the living location I had to find out which prefecture Ikebukuro was in because Facebook expects locations in Tokyo to be input as a particular format. Ikebukuro, Tokyo or just Tokyo is not accepted, this is likely to try to prevent fake data being inserted. The same was true when I tried to state where I was from, I wasn’t able to only say Ireland, which is all the show reveals about Celty’s original location, so I put Dublin, Ireland’s capital. I posted some silly updates and complicated relationship status, more references to the show. This is something I think a person trying to pretend to be Celty may say, similar to what can be seen to other parody social network accounts, particularly those seen on Twitter. The only friends this account has is Oliver Krowe, his fake facebook account and my own account. I didn’t want to try to add more people because the thought of it makes me feel quite embarrassed. I didn’t want people who weren’t in on the assignment to think I genuinely was that much of an obsessive fan. I did attempt, and was successful in joining the Bournemouth University anime club Facebook group by someone who wasn’t aware of the online task. I have met and spoken with Teniola, the moderator who approved my request, on a few occasions, though we are not familiar enough to be Facebook friends. I assume she accepted my request based on my name and photo which she recognised from the show and therefore assumed I was the obsessive fan I attempted to be. Or she may have looked at Celty’s friends list and seen Oliver Krowe who is this years anime group leader and approved my request because of this. In the show, Celty is unable to speak because she has no head. To communicate she types a message on her PDA and holds it up to the recipient. Flash forward to 2013 where PDA’s no longer hold the dominance the once did, I upgraded Celty’s device to a smarthpone. Of course on Facebook, this is completely redundant, the real Celty would likely just type a message, not take a photo of her smartphone and then post that photo. Again this reference only has meaning to people who have prior knowledge of the show, so I decided to post it on Oliver’s wall. Sadly I did not receive any responses. Finally, I added a few likes. Motorcycles, Ikebukuro and of course the BU: Consumer Culture page where alter egos can live in harmony. The online assignment for my current media theory strand (Consumer Culture, Identity and the Media) is to make a fake Facebook account and write up my experiences. The profile picture needs to be a digitally manipulated version of ourselves, so I opted to make myself look like Celty Sturluson from the anime “Durarara!!”. Unfortunately, I don’t own a full leather cat suit or a cleavage. Discuss ways in which academic concepts and theories can help us to understand digital media texts. Your answer MUST (a) explore two or more of the concepts and theories introduced in key lectures and readings and (b) analyse a selection of examples including contemporary digital media texts AND an example of your own production work. The essay had a 3000 word limit with an addition 1500 word annotated bibliography. 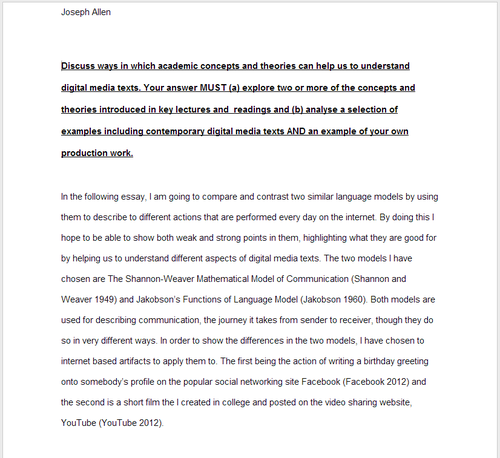 My finished essay can be read here and the bibliography is here.